Sharikov, second from left, with 1996 Russian Olympic gold medal Sabre team. Sabre specialist Sergei Sharikov won four medals, two of them gold, competing in three Olympic Games for Russia. In Atlanta in 1996, he won a gold medal in Team Sabre and a silver medal in Individual Sabre. He, again, took a Team gold medal in Sydney in 2000, and a Team bronze at the 2004 Games. Sharikov won the gold medal in Individual Sabre at the 2001 Universidad, and a Team Sabre gold medal at the 2001 European Championships. He also won bronze medals in Individual Sabre at the 1998 and 2000 World Championships. In 1994, Sharikov won the Individual gold medal at the World Junior Championships. The following year, he earned a Team silver medal at the World Championships, and an Individual silver at the World Cup. 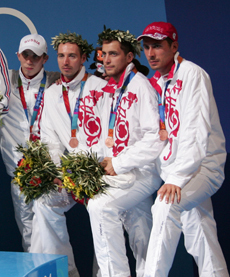 Sharikov coached the 2001 Russian Maccabiah Games fencing team.